No matter where you are in life, there is one fact that remains undisputed- whether you live on an acreage, traverse the sprawls of the urban jungle, reside in suburbia, or call the country home, there is no escaping the always-there growth of nature. It may be apparent in a pretty potted plant, in the scrawly sand dune shrubs or the persistent pavement weeds, but nature has a way of making its presence felt. While some of the world’s plant-life may not always be welcome, there are just as many specimens that are revered and appreciated- flowers and trees the most common. Trees in particular seem to hold a special place in the hearts of most people. Everybody appears to have at least one memory that revolves around a wooded trunk, multi-hued foliage or growing fruit. It could be a childhood memory of climbing thick trunks to sit in a treehouse, or the musings of an older person who is comforted by the endurance of a small sapling or majestic oak, but trees manage to show the intrinsic link between humankind and nature. If you listen to ABC radio (in particular Radio National), you may have come across a project that involved listeners writing in and telling stories about their favourite tree memories. The Tree Project encouraged written contributions (in the form of short anecdotes and poetry) highlighting the physical, emotional and psychological importance of trees in peoples’ lives. 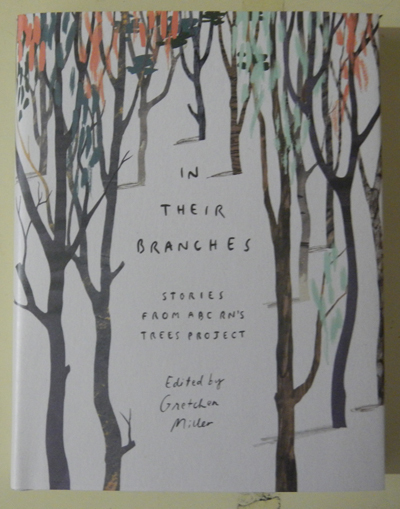 From the many hundreds of audience contributions, just over one hundred were selected to be published in a unique collection- In Their Branches: Stories From ABC RN’s Trees Project. Edited by long-time ABC employee and presenter Gretchen Miller, this compilation is separated into subcategories that best describe the emotions and content of each piece- History, Delicious, Sanctuary, Land, Joy, Loss, and Soul. Each contribution is short (one or two pages at the most), and full of emotion. There is a chance, while reading some of the stories, that you may recognise similar scenes from your own childhood, or be able to relate to some aspects of a person’s reflection- proving that the emotional link between tree-life and humanity is universal. These heartfelt offerings are accompanied by pretty illustrations from Allison Colpoys, adding to the overall appeal of the book. This collection would make the perfect gift for the arborist in your life, or for someone who feels a deep connection with nature’s wooded gifts.